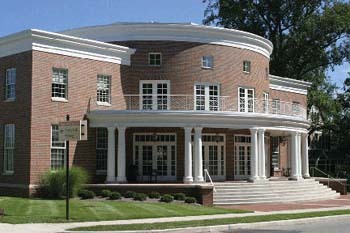 Trippet Hall is named after Byron K. Trippet, who was a 1930 graduate of Wabash. He was a Rhodes Scholar at Oxford University and returned to Wabash in 1936 to begin a 30-year career as teacher and administrator. He served as the College's ninth president from 1955-1965. A staunch proponent of the liberal arts, Trippet served as professor, assistant dean, dean, president, and trustee during his Wabash tenure. Construction was completed in late August 2002 and was fully occupied in September 2002. Trippet Hall houses Admissions, Financial Aid, HEDS, Center of Inquiry and the Wabash Pastoral Leadership Program. Trippet Hall is the "official" welcome center of the College. Stop by for a visit and tour our facilities.